Steve Bailet at ABYS Yachting tells me that the 29.8m motor yacht Melody Nelson has just been listed for sale by Sebastien Clave. 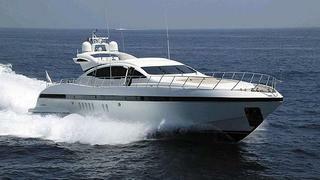 A Mangusta 92 built by Overmarine in 2003, Melody Nelson accommodates eight guests in four staterooms and twin 2000hp MTU engines driving KaMeWa waterjets give her a cruising speed of 28 knots. Lying in the South of France, Melody Nelson is asking €1.8 million.